Finding lost rings is what we do, but sometimes we are not successful. Nothing breaks my heart more than going out on a lost ring hunt and not finding the ring. I’m a pretty persistent person and will search over and over until I have exhausted all possible area or scenarios. This was the case with Faith’s ring. 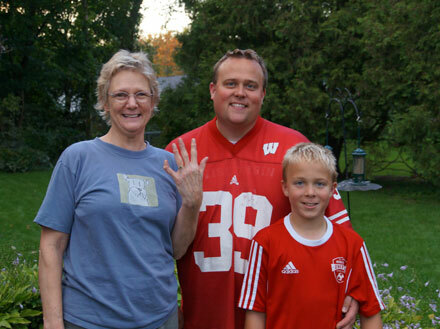 She was pretty certain she had lost the ring in her back yard, but after searching for awhile we did not find it. My son was on his way to a soccer game, so my time was limited to only about 30 mins. We were about to give up and come back after the game, when I asked Carter to search the plants one more time with our small hand held metal detector, called a pin pointer. Did we find it … well you’ll have to read the story as told by Faith below. Among other things, I inherited crooked little fingers and big knuckles from my father. I’m also left-handed, and my sister had given me some left-handed pruners. The big knuckles mean that my wedding ring has had several modifications to make it fit my finger right, with the last being hinges on the sides and a clasp on the palm side of the ring. After I had done more gardening than I planned, I had another errand to run, and when I looked at my left hand on the steering wheel, my stomach dropped about a foot when I realized my wedding ring was gone and I had no idea when – or where – I had lost it. Because I’m usually pretty aware of it, I thought I must have lost it in the garden – but where? I was all over the yard and it could be anywhere – in the mulch, in the dirt, in the grass, in the overcrowded hostas, in the birdfeed bin – anywhere. When I got home, my husband and I started to search, but it was getting dark, so we decided to try again later. On my next day off, I checked with the places that I had visited on the Thursday that I lost the ring, but no one had seen it. I still suspected it was in the yard, but I still didn’t know specifically where. That listing led me to Dan Roekle, who I contacted. After coordinating our busy schedules, he and his son Carter came over on a Saturday afternoon. I showed them the two specific places in the yard that I thought were the most likely places where my ring was likely to be. Dan commented on the large number of pieces of metal that he was getting hits on, mostly from the roof replacement that we had a few years back. He showed me one of the pieces and then he continued his search. A few minutes later, he came back to where I was and with a totally straight face, said “Sometimes we find other things, too” and opened his hand. There was my ring! He had found it in the middle of the leaves of a hosta plant – the perfect place to hide. The grin on my face still hasn’t gone away! And there’s one more thing my father gave me – he was a clergyman who married my husband and me, so part of the service was blessing our rings. He died seven years ago, and knowing that I have back the ring that he blessed, means more to me than I had ever thought it would. Thank you so much, Dan and Carter! Every ring truly has a story. Wow. It’s amazing how a piece of jewelry can carry so many memories and have so much meaning. Never give up hope. If you know someone who has lost their ring outside in the yard, in the water, in the snow, in a volleyball court or in a flower garden … give us a call! Doesn’t matter if it was yesterday, the week before or 10 years ago – we can find it. Please “Like” our Facebook page and you will get every Lost Ring Story delivered to you. Remember, every ring has a story, what’s yours? 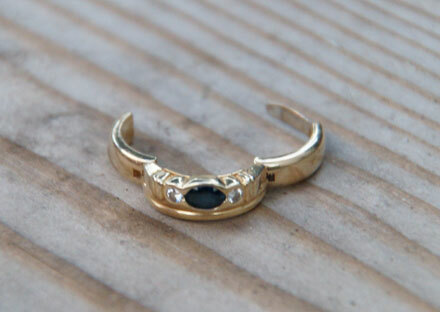 Metal Detector Search for a Lost Earring – Redemption!